Happiness Is... 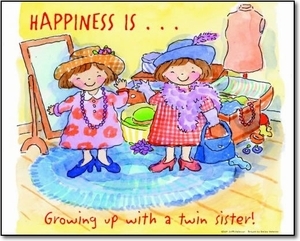 Growing up with a Twin Sister 11" X 14"
This "dress up" print is perfect for a twin sister's bedroom! A great gift for twin girls. "Happiness is...Growing Up with a Twin Sister!" Print will fit any standard 11" X 14" picture frame.